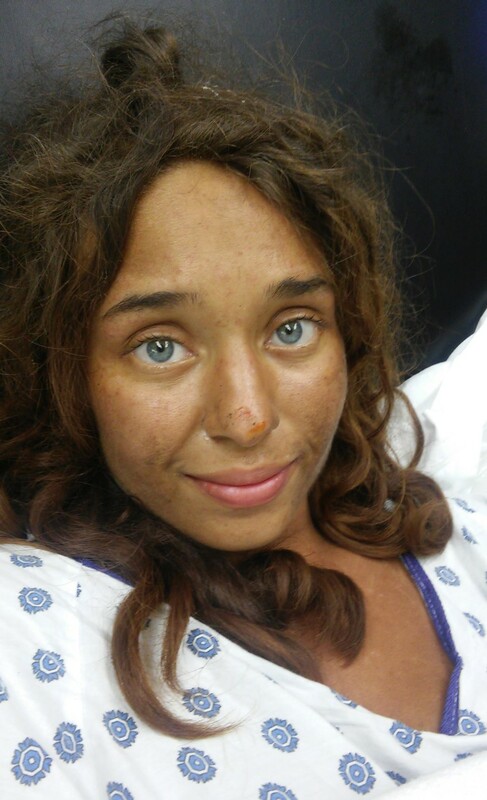 An Alabama woman who was rescued after wandering naked in dense forest for nearly a month, now says she feels grateful to be alive. Lisa Theris, who is legally blind, was discovered naked on the side of Highway 82 Tuesday, her skin browned from the sun and her entire body covered in scars from bug bites and poison ivy. Theris had been reported missing and was presumed dead. Little is known about the circumstances that left her stranded in thousands of acres of woods for nearly 28 days. Police have launched an investigation. But for now, the 25-year-old told NBC-affiliate WSFA that she is happy to be home and recuperating with family. Theris survived by drinking muddy water and eating berries and mushrooms. At her lowest points, she said thoughts of her family forced her to continue searching for help. Theris said she is now focused on regaining her strength and eventually plans on returning to college.The only souvenir she saved from the harrowing ordeal is the large root she used to help her walk. Eventually, Theris stumbled out of the forest and onto the Highway 82, where Judy Garner, a Florida woman who was driving by, saw her and called 911. “When I saw the road it was just … unbelievable,” she said, her voice breaking. She added that the entire experience has given her a renewed outlook on life.